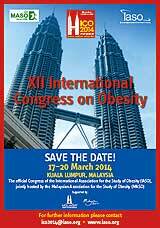 The official Congress of the International Association for the Study of Obesity (IASO), jointly hosted by the Malaysian Association for the Study of Obesity (MASO). LATE BREAKING ABSTRACT deadline 31 January 2014!! Malaysian Participants can pay the "Early Bird Rate" of GBP475 (saving a total of GBP125) and the Dateline is 15 February 2014. You may do this as a GROUP REGISTRATION under your organisation/institution and deal directly with the ICO 2014 Secretariat <njoyner@iaso.org>.